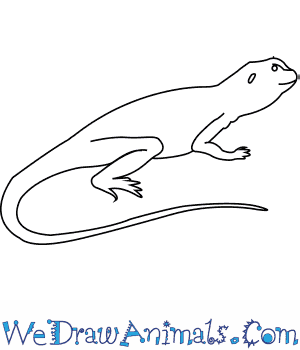 In this quick tutorial you'll learn how to draw a Collared Lizard in 6 easy steps - great for kids and novice artists. At the bottom you can read some interesting facts about the Collared Lizard. 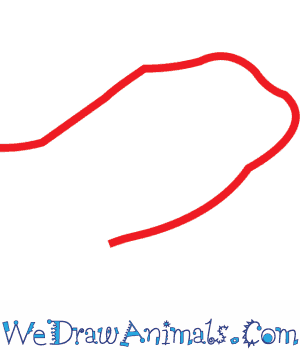 Step 1: First, draw a lumpy rectangle shape for the face, leaving one end open. 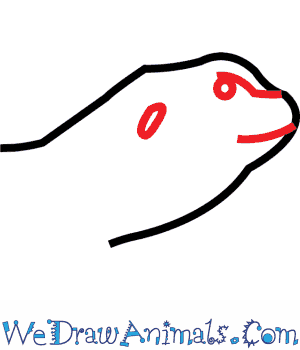 Step 2: Now add the facial features: circles for the eye and ear, a curved line for the mouth. Step 3: Draw a nearly straight line for the back, and two broken lines for the lower body. 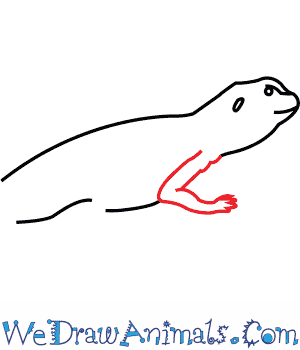 Step 4: Draw the front leg. Make it slightly bent, as if our lizard is climbing. These legs have small toes. Step 5: The back leg has a paperclip shape to it. 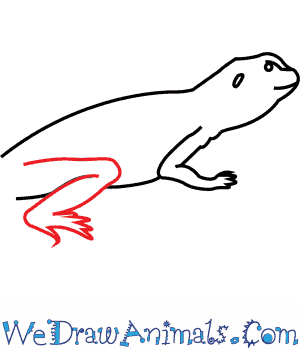 The toes on the back foot are a lot longer because this lizard can run on its back legs! 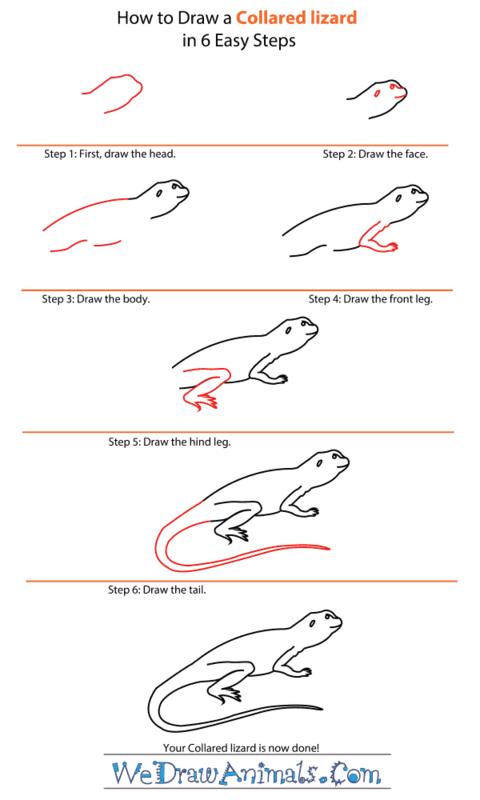 Step 6: Add a long, skinny tail that curves around your lizard. You are done! 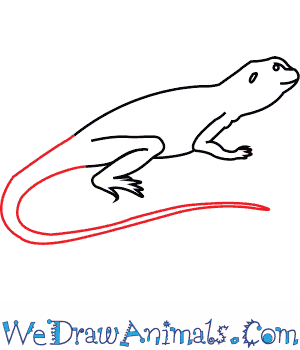 This lizard gets its name from the black bands around the neck and shoulders. The Collared Lizard is a member of the reptile family and the scientific term for them is Crotaphytus collaris. Other popular names for this species are Common Collared Lizard, Eastern Collared Lizard, Oklahoma Collared Lizard, and Mountain Boomer. This animal gets its name from a white strip on the back and sides of the neck with a black shadow underneath that looks like a “collar.” They are light brown, have a large head, and powerful jaws. Males have a blue-green body with yellow stripes. They can be over 1 foot in length. There is a normal habit of running on 2 legs. Their average running speed is 16 miles per hour. The species requires at least 80 degrees Fahrenheit for activity. This animal prefers a climate of up to 110 degrees Fahrenheit for resting. 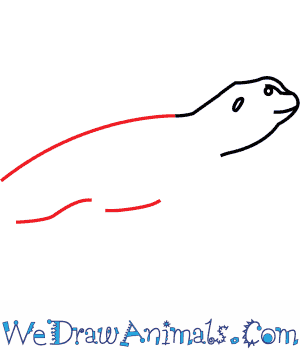 These silent reptiles are native to North America, require much space to run and often sprint, but are easily tamed and kept by humans as pets. In order to survive captivity, calcium and ultra-violet light must be supplemented. They eat fruit, vegetables, small mammals, other lizards, but mostly insects. During mating season, males will kill other males.